In a previous post, I explained that this fall I worked with the children on understanding and interpreting the Lord’s Prayer. The Lord’s Prayer, or “Our Father,” posed many interesting opportunities to discuss themes that each and ever one of us struggle with. It was a challenge preparing a lesson for children with emotional disturbance dealing with complicated teachings in scripture. It was an exercise in combatting “Christianese” and the simple Sunday school answers (you know… when in doubt, just answer “Jesus!”). It was important to give context to the familiar words and phrases I know that they will encounter when outside the very supportive and nurturing atmosphere of Intermountain and the chaplain’s program (sin, evil, forgiveness, etc.). It wouldn’t be enough for me to simply edit out or rephrase words from the Lord’s Prayer because I knew they might be difficult for them to understand. We would have to take the time to carefully digest the words of scripture and make sense of them for a child that had experienced significant trauma and loss. 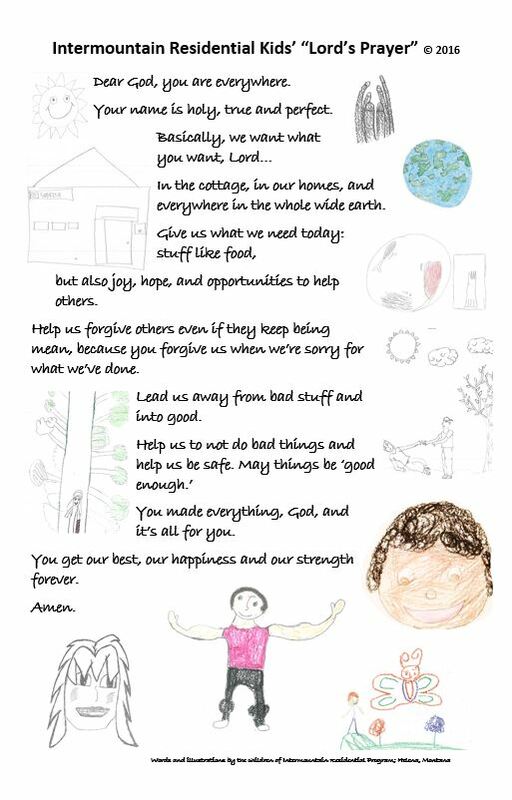 So, rather than me being the one to rewrite and interpret the prayer, at the end of each lesson I took the kids’ suggestions on what our “Intermountain version” of the Lord’s Prayer might look like. Here’s what they came up with… I think you’ll be blessed. Dear God, you are everywhere. Your name is holy, true and perfect. joy, hope, and opportunities to help others. because you forgive us when we’re sorry for what we’ve done. Lead us away from bad stuff and into good. You made everything, God, and it’s all for you. You get our best, our happiness and our strength forever.